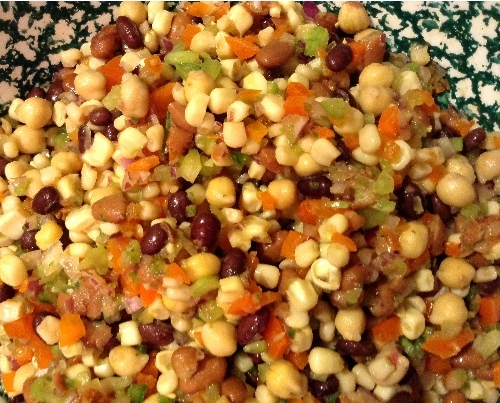 For this Texas Caviar recipe, I substituted light agave nectar in the Marinade for the granulated sugar used in the original Junior League recipe. I use overstrike (like this) below to denote changes I made to the original ingredient quantities or substitutions. In a saucepan, combine all of the Marinade ingredients and bring to a boil, stirring occasionally. 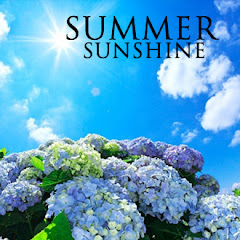 Remove from heat and set aside to cool to room temperature. Drain and rinse each can of beans and corn under cold water. In a large colander, drain all well. In a large bowl, combine all of the Dip ingredients. Pour over the cooled Marinade and toss well to coat. Cover and chill for twenty-four (24) hours for the flavors to mingle with one another. 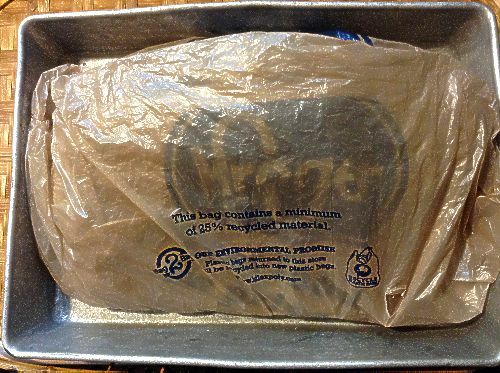 For tips about marinading in a ziploc plastic bag, see Notes below. If desired, use a slotted spoon to transfer the Texas Caviar to a glass bowl or shallow dish lined with red cabbage leaves. Refrigerate the reserved Marinade. 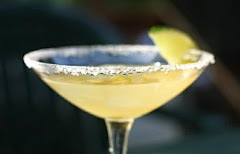 If you choose to garnish further, add the chopped scallion tops and/or diced fresh avocado at the last minute before serving with tortilla chips. Add back any reserved Marinade to the Texas Caviar before covering and refrigerating unused portions. Any pools of Marinade in green and white bowl photos result from an incident where I forgot to buy black-eyed peas which would have added about another 1.5- to 2-cups of solids. In the Marinade, I use less of the agave nectar light to substitute for one cup of granulated sugar than the 2/3 cup (10.5+ Tbsp) suggested on the company's website. I like the balance of flavors in the modified Marinade. 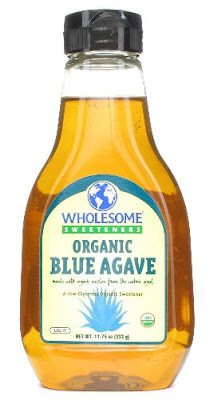 If you use more agave nectar, be sure to reduce other liquids in the recipe as suggested via the company's web site. I have substituted one (15-oz / 425g) can of organic cannellini beans for the garbanzo beans; I prefer the garbanzo in this recipe. 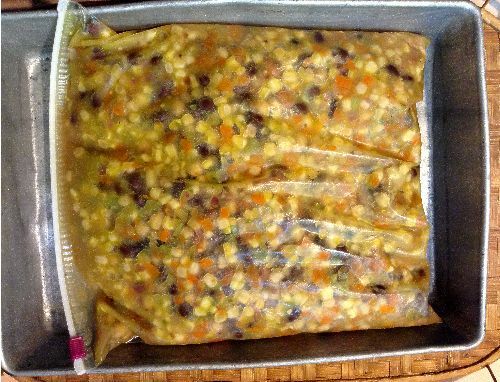 Next time I will use frozen black-eyed peas (defrosted). 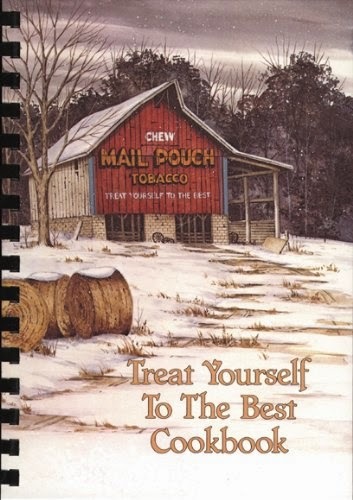 For canned chilies. I will occasionally use one (4-oz / 113g) can Ortega Hot Fire Roasted Diced Green Chile Peppers, drained and chopped into smaller pieces, instead of my preferred fresh jalapeño pepper. For us, one (4-oz) can of the hot chile peppers is plenty. 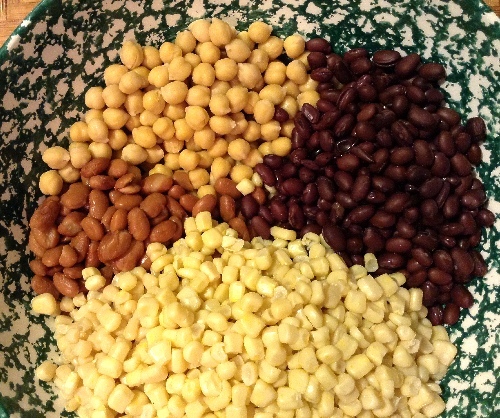 Without the black-eyed peas, here's a photo of just the other legumes and shoepeg corn for purposes of considering the color impact of substitutions. 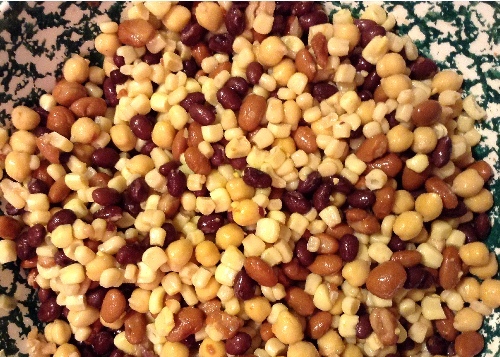 For example, I made a batch of this recipe using red kidney beans because I thought I would like the additional color; however, I will not do that again because, in my opinion, the kidney bean looked out of place in this dish. I think the kidney beans are too large and do not contribute any significant flavor improvement. I chose an orange bell pepper because I was omitting the pimento and the orange bell peppers were on sale. 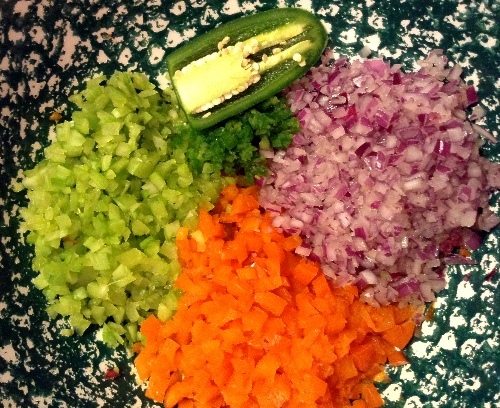 Since the fresh jalapeño pepper and celery are both finely diced, however, I think green, red, or orange bell pepper add nice color to this recipe.